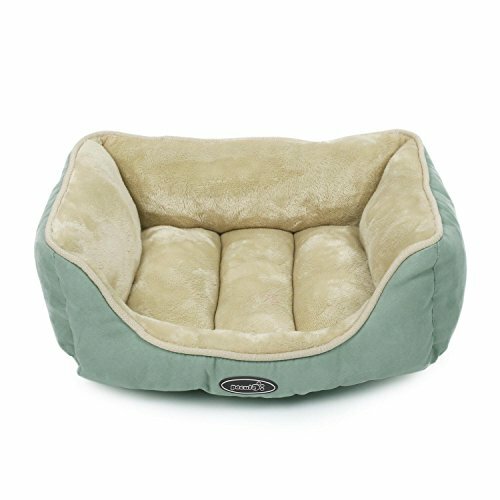 ☀SOFT AND COZY BED - Micro suede exterior and coral fleece interior, stuffed with soft polyester fabric, offers maximum comfort and warmth for your furry friends. ☀SOLID RECTANGLE STRUCTURE - With different fabric covered on each side, the bed is reversible to use with different touch feel as you prefer, the stitching along the sides of the bed hold the filling in place and help to retain the bed\'s structure. ☀S for puppies and cats: External dimension 15.7x18.9x7.09\"(40x48x18cm), internal dimension 8.6x10.6\"(22x27cm). ☀MACHINE WASHABLE - Easy clean, wash the entire bed on the gentle cycle with cold water and tumble dry in low heat.